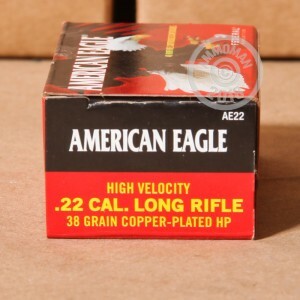 This versatile .22 LR ammunition from Federal's American Eagle brand works great for small game hunting or target shooting. 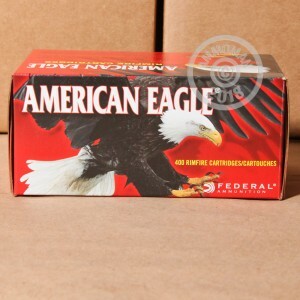 Each round in this box of 40 fires a 38 grain copper-plated hollow point bullet. 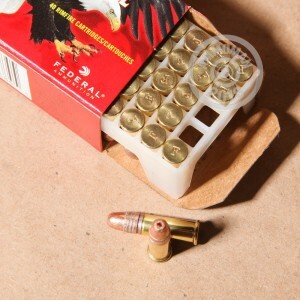 Federal ammunition is loaded in Anoka, Minnesota using rimfire-primed brass cases. .22LR is affordable and sometimes hard to find, so why stop at 40 rounds? Place an order for $99 or more and get free shipping from AmmoMan.com.